Agile Snowball is a financial tool that will attempt to find the best repayment plan for a given scenario, if one exists. If you have multiple debts it can be difficult to figure out which one should be given the highest priority. The Snowball technique is a method of debt repayment that takes a single monthly payment and distributes it amongst the debts in the most efficient way possible. People often wish to pay off the smallest debts first to gain a sense of accomplishment but this has the potential to lead to large amounts being paid in interest. By paying the highest interest amounts first you can be assured that you are minimizing the cost of repayment. Instead of going to a consolidation service the Agile Snowball can tell you how to keep track and repay all your debts in the timeliest manner. When starting the snowball tool for the first time users will be presented with an empty Snowball List. To get started, click on the Add Snowball button. An empty Snowball will be created with the current date. Selecting this Snowball will advance to the Edit Snowball screen. (Refer to Add/Edit Snowball for more details). 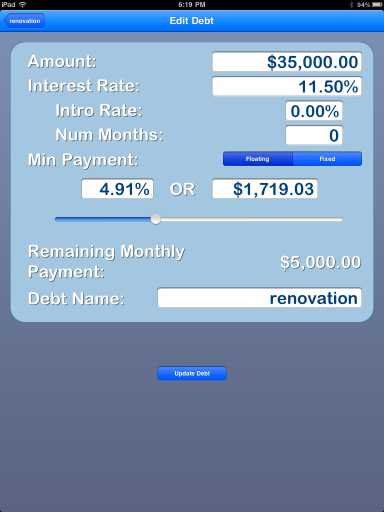 After clicking on Update Snowball the Add Debt screen will be presented (Refer to the Add/Edit Debt for more information. 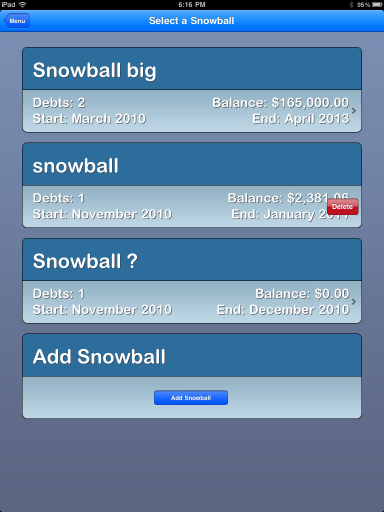 Clicking on the Add Debt button will create the debt and add it to the Snowball with the supplied information and the Snowball Overview screen will be shown. From here Snowball Details can be viewed or additional debts may be added. 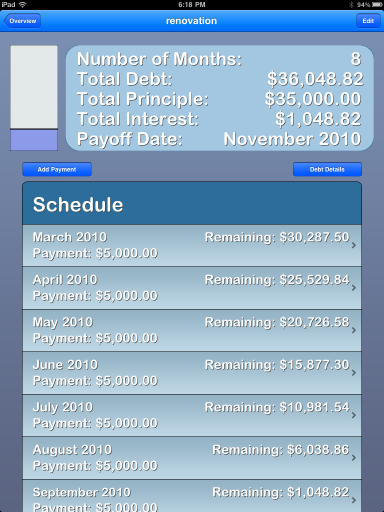 Selecting a debt will bring up the Debt Summary screen which will outline the specific monthly schedule for the debt. Debt Details may be viewed and Additional Payments may be made as well. Selecting a month will bring up the specific month details, including a list of all Additional Payments that were made during that month. 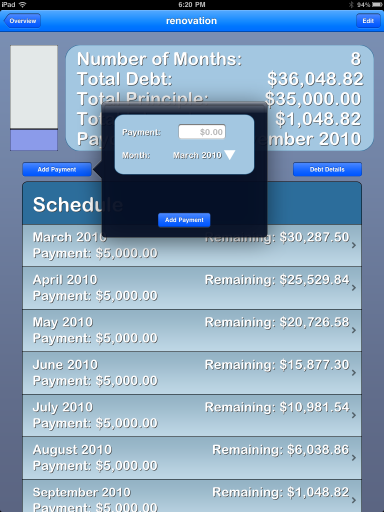 Monthly Details can be viewed and the option to add Additional Payments can be made. This screen lists all the Snowballs that have been created. To add a new Snowball, press the Add Snowball button. An empty Snowball will be created with default settings. Clicking on the Snowball will then bring up the Edit Snowball screen. To delete the Snowball, perform a swipe gesture across the screen on the entry. The Delete button will be displayed. To cancel, click else where on the screen. 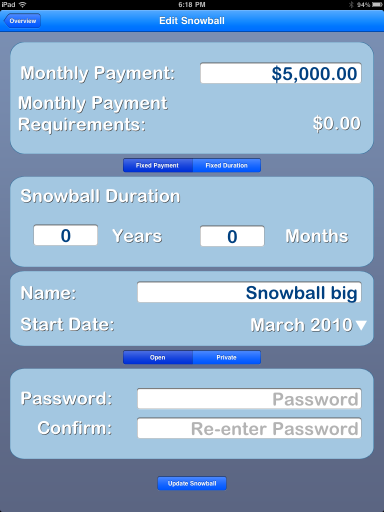 If a Snowball is made private, a password will be required to view any details about it. To enter the password click on the entry and the Password screen will be displayed. Enter the password and click elsewhere on the screen. If the password is correct the Snowball will be loaded. There are several different options available depending on how you wish to configure the Snowball. 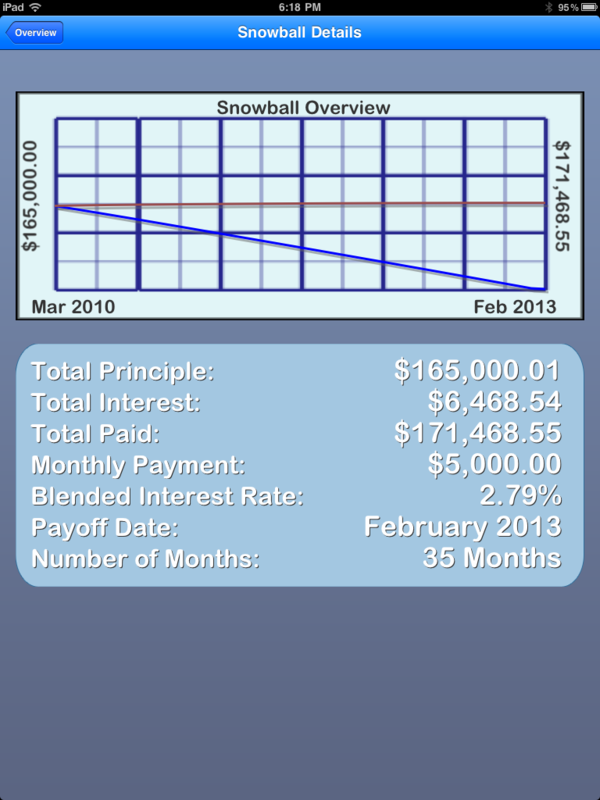 The Monthly Payment is the total amount of money that will be divided amongst all of the debts in the Snowball. The Monthly Payment Requirements is the minimum amount of money that is required based on the current debts. If the minimum value is not met then it will be impossible to pay off debts. Traditionally when using the Snowball Method for repaying debts, a Fixed Payment is used and the number of months is calculated. Some people might want to finish paying down their debts in a certain amount of time so there is an option to choose between using a Fixed Payment or a Fixed Duration. When in Fixed Payment mode the Snowball Duration will be ignored and when in Fixed Duration mode the Monthly Payment is ignored. The Snowball Start Date can be changed to be either earlier or later to reflect the real world schedule. As well the option to make a Snowball private is available to protect personal information that may be contained. When making a Snowball private a password must be entered and confirmed. There is no way to recover a lost or missing password. The Add/Edit debt screen contains a fair number of fields that are optional to enter, but the more data that you can enter the more realistic the resulting Snowball schedule will be. This is the current balance of the debt at the start of the snowball. This is the Annual Percentage Rate or Yearly Interest Rate of the debt. This field will only apply to a few debt scenarios where there may be a promotional interest rate for part of the term or no interest rate at all. Most debts or loans will require that at the very minimum something must be paid. This can be either a Floating Payment i.e. a percentage of the total amount, or a Fixed Payment i.e. a fixed amount must be paid each month regardless of the current balance.A slider control is placed on the screen to help visualize the minimum payment. For some people the minimum payment could be an arbitrary number that they wish to pay and not dictated by the repayment agreement. This value represents how much money is left after paying all the current debts minimum payments in the Snowball. If the debt being added has a minimum payment that is greater than the remaining balance then the monthly payment must be increased in the Snowball to proceed. The name of the debt. After all the fields have been populated, press the Add or Update button to save the changes. 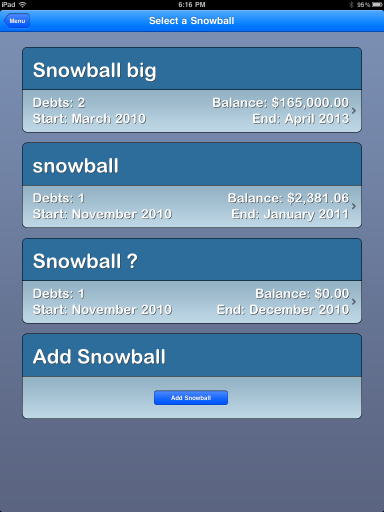 The Snowball Overview screen displays the list of all debts in the Snowball as well as some quick stats about the Snowball. Additional debts can be added by pressing the Add Debt button at the bottom of the list. To edit the Snowball configuration press the Edit button in the top right corner. For even more details about the Snowball pressing the Snowball Details button will bring up the Snowball Details screen. Some users may wish to switch between paying debts with the Highest Interest Rate or Smallest Balance first. To pay off all debts with the smallest amount of interest, the Highest Interest Rate first would be the best option. To pay off more debts quicker, but potentially more interest, chose the Balance option. The quick stats displayed are Number of debts in the Snowball, Total resulting Debt, Total Initial Principle, Total Interest generated over the repayment, and the expected Payoff Date for the entire Snowball. The graph to the left of the Quick Stats is a visualization of Principle vs Interest. The Snowball Details screen is composed of a chart and a list of stats about the Snowball. The chart shows the current balance of all the debts in blue over the duration of the Snowball. The red line shows the initial balance of the Snowball with the interest generated. The total combined principle of all the debts. The total combined interest generated over all the debts. 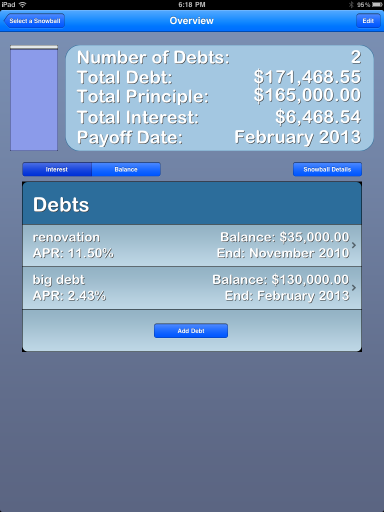 The combined total of principle and interest generated for all debts. The monthly payment of the snowball. The effective interest rate of all the debts in the snowball as if it were a single entry. The estimated date in which all the debts will have been paid off by. The estimated number of months for the Snowball to be completed. The Debt Overview screen is similar to the Snowball Overview screen only instead of a summary of all the debts only a specific one is looked at. The same format is used with some changes in the information that is shown. Instead of a toggle to change the Debt Priority Order, an Add Payment button is present. This will allow Additional Payments to be made to the debt. The duration, in months, of the specific debt until it has been paid off. This is the combined total of principle and interest generated by the debt. This is the initial principle of the debt. This is the interest generated over the repayment of the debt. This is the estimated month in which this specific debt will be paid off completely. The graph on the left is very similar to the Snowball Summary graph except that instead of just showing the principle vs interest it is also shows the relation to the total value of the Snowball. The Schedule is the monthly payment schedule from start to finish of the debt. Each entry displays the month of the entry, the remaining balance of the debt, and the payment that must be made for that month. 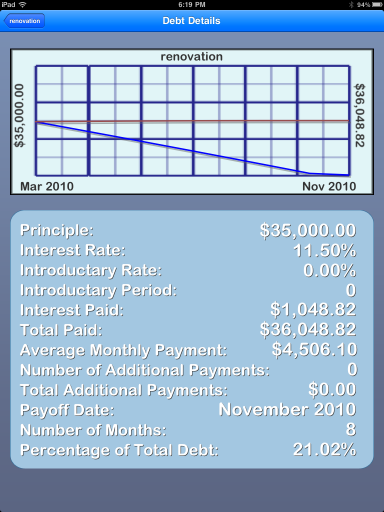 The Debt Details screen displays a chart, which tracks the initial principle plus interest generated each month in red and in blue tracks the remaining balance after each month. The initial balance of the debt. The interest rate of the debt. The promotional or temporary interest rate, if applicable. The length of the Introductory Rate, if applicable. The dollar value of how much interest will be paid over the course of repayment. The dollar value of how much will be paid over the course of repayment. The average per month that will be spent on this debt. The number of additional payments made towards this debt. The dollar value of any additional payments that have been made. The date in which this debt will be completely paid off. The number of months until the debt will be completely paid off. The size of the debt in relation to all other debts in the Snowball. The Month Overview screen uses the same general format of the other overview screens with the focus being the current month. The left hand side of the screen has a graph that visualizes the amount if principle vs the amount of interest in that current month. The center buttons are for adding an Additional Payment for the current month or visiting the Monthly Details screen for a more in depth analysis of the current month. At the bottom there is a list of all the Additional Payments made during the month and their payment value. Clicking on an entry will bring up the Edit Payment screen. The number of additional payments made during the current month. The total payment that was made during the month including Additional Payments. The dollar value of the Additional Payments. 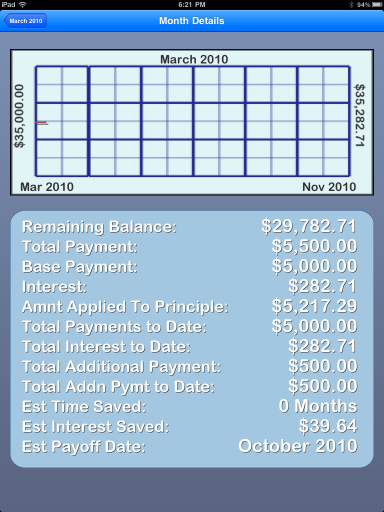 The estimated interest that would be saved by the additional payments made in the selected month. The estimated number of months that would be saved by the additional payments made in the selected month. The remaining balance after the current month is over. The total payment that was made during the month including any Additional Payments. This is the calculated payment made by the Snowball that must be paid for this month. This is the amount of interest that was incurred during the current month. This is the amount of the payment that was applied directly to the principle balance. This is the total number of Base Payments that have been made to the debt to date. This is the total amount of interest that has been incurred up to date. This is the total amount of Additional Payments made during the month. This is the total amount of Additional Payments that have been made up to date. This is the estimated number of months that have been saved by the Additional Payments. This is the estimated amount of interest that has been saved by the total Additional Payments. This is the estimated date in which all the debt will be paid off, according to the payment history up till now. 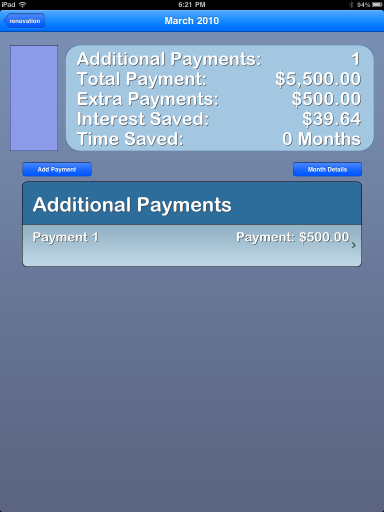 The Add / Edit Additional Payments screen is fairly straightforward. Depending on where the screen is entered from there will be slightly different options. Regardless of where the screen is entered from there will be the Payment Amount, which is how much extra that will be paid. The other option will be the month in which the payment will be made. If you have entered the screen from the Debt Overview screen you will be able to choose the month in which the payment has been made. If entering the screen from the Month Overview or Edit Payment routes then the month will be locked to the current month. There are only a few options for Agile Snowball. The Reset Data option will wipe out all financial related data in the application. This option can not be undone. It will erase even password protected data. This allows the in-app tutorials to be turned on or off globally. On each primary tutorial screen there is an option to Disable Screen, which prevents that specific screen from showing it’s tutorial again. Reset Tutorials will re-enable all the disabled tutorial screens. The amortization addon allows Agile Snowball Lite to use the Fixed Time Duration for repaying debts. Once this addon has been purchased it is a permanent upgrade. If the application has been re-installed on a device, the addon can be re-downloaded for free by purchasing it with the original account again. This addon may contain content from the other addons. The full unlock addon will basically convert the lite version into the full version of Agile Snowball. This upgrade is permanent. If the application has been re-installed on a device, the addon can be re-downloaded for free by purchasing it with the original account again. This addon may contain content from other addons.